For 2015 Jeep® Patriot delivers unmatched 4×4 capability in all weather conditions, fuel economy up to 30 miles per gallon (mpg), more than 30 safety and security features and a starting U.S. Manufacturers Suggested Retail Price (MSRP) of $16,495 for 4×2 models and $18,695 for 4×4 models. 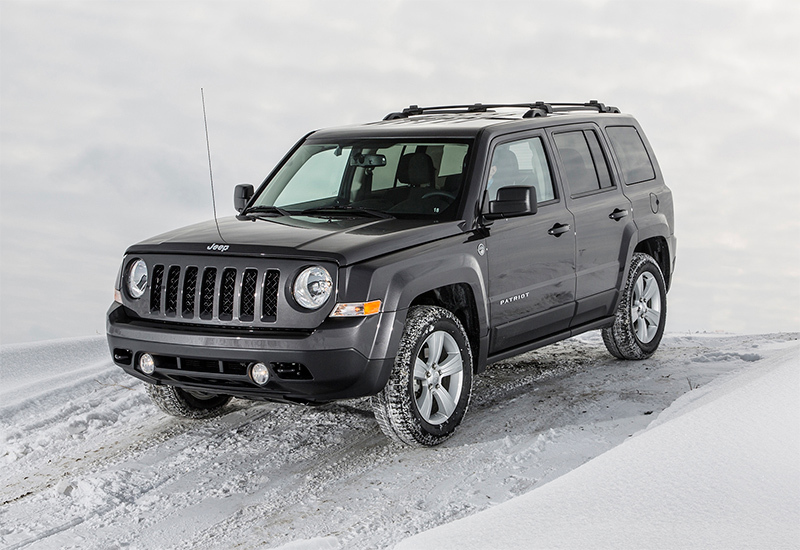 The 2015 Jeep Patriot is the best-priced 4×4 in America. The 2015 Patriot is unmistakably a Jeep SUV, designed to appeal to compact-SUV buyers who want traditional Jeep styling with best-in-class off-road capability at an affordable price. New for 2015 is Eco Green Clear Coat, which replaces Rugged Brown. Garmin Navigation is now available as an option on the Latitude model, and a new dome light replaces the removable, rechargeable flashlight. In addition, the popular Altitude model is back for the 2015 model year, available on 4×4 models and 4×2 models. The Altitude Package features a unique “blacked out” theme, with a distinctive black gloss finish around the trademark seven-slot Jeep grille and headlamps, black roof rails and a step pad, sport mesh cloth and vinyl seats heated front seats and 18-inch black aluminum wheels, delivering a unique style and exceptional value. A new-for-2015 “High Altitude” Package is available for 4×4 models with the six-speed PowerTech automatic transmission. The High Altitude Package includes leather seating, power sunroof, power six-way driver seat and 17-inch Mineral Gray wheels. Packed with value and convenience for drivers and passengers, the 2015 Jeep Patriot standard features include: front-seat-mounted side air bags, electronic stability control, electronic roll mitigation, Hill-start Assist, anti-lock brakes, illuminated cup holders, sunscreen glass, fog lamps, outside temperature display, rear fold-flat 60/40 folding seat, rear window defrost and wiper, tilt steering column, cruise control and sliding visors with mirror. In addition to the standard features, the 2015 Jeep Patriot offers an array of clever features consumers will appreciate whether commuting to work, exploring out-of-the-way places or driving in challenging weather conditions. 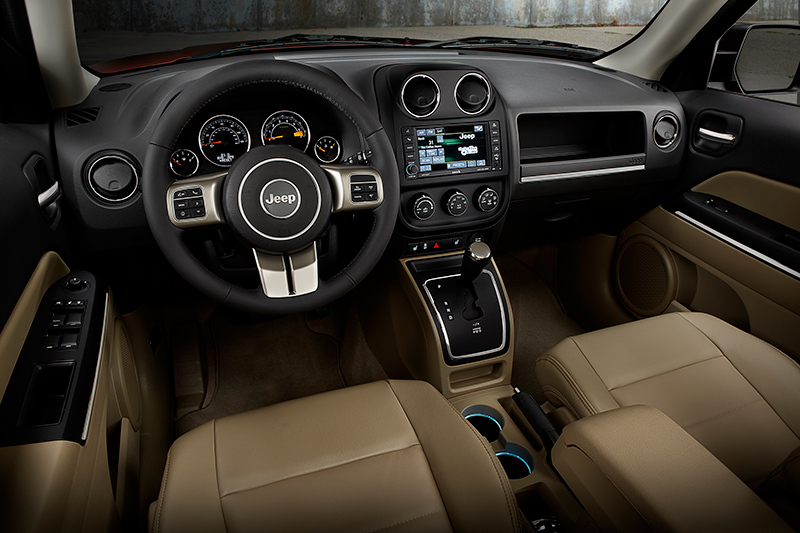 A Uconnect Media Center with iPod interface, SiriusXM Radio, navigation with SiriusXM Travel Link, power sunroof, a premium audio system with nine Boston Acoustic speakers, articulating liftgate speakers, and fold-flat rear seats are some of the available features that make the 2015 Jeep Patriot the perfect compact SUV, enabling drivers and passengers to enjoy any adventure. 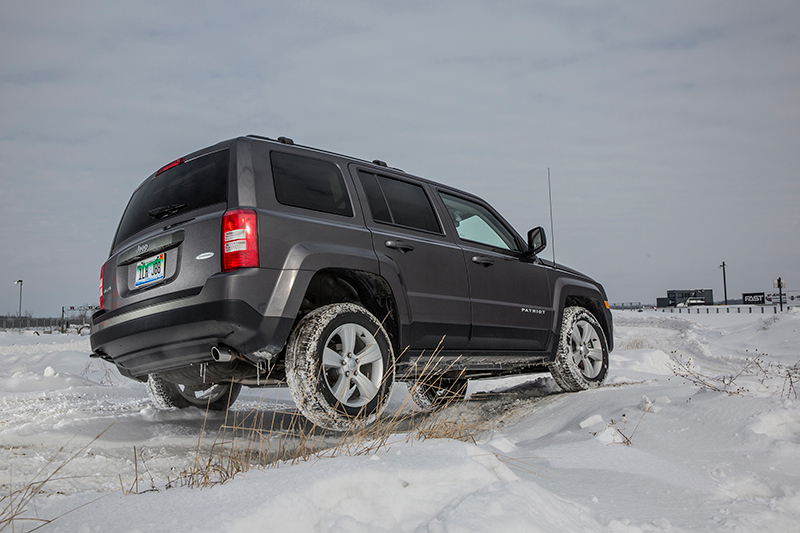 For 2015, the Jeep Patriot continues to offer an All-weather Capability Group option, which includes Goodyear 17-inch all-terrain tires, all-season floor mats, daytime running headlamps, engine block heater and tow hooks, making the Patriot the most capable compact SUV off-road and in all weather conditions. The 2015 Jeep Patriot offers customers unsurpassed 4×4 off-road capability with the Jeep Freedom Drive II four-wheel-drive system. The Jeep Freedom Drive II 4×4 off-road package is an available four-wheel-drive system that delivers Jeep Trail Rated capability in Patriot form. The Freedom Drive II off-road package includes: second-generation continuously-variable transaxle with low range (CVT2L) that engages when the off-road mode is activated, 19:1 crawl ratio, 17-inch all-terrain tires and aluminum wheels, a full-size spare tire, skid plates, tow hooks, fog lamps and manual seat height adjuster. The available Freedom Drive II off-road package is recommended for off-road situations that include steep grades, occasional wheel lift and rock or log climbing. The 2015 Jeep Patriot’s powertrain is designed to deliver world-class performance and refinement in all weather conditions and fuel economy of up to 30 mpg, all at an affordable, value-packed price. The 2015 Jeep Patriot delivers up to 2,000 pounds of towing capacity. 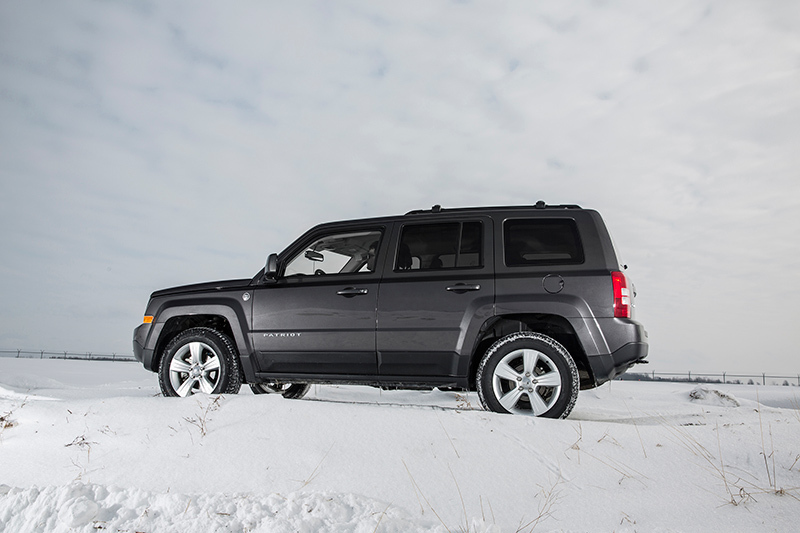 The 2015 Jeep Patriot offers three available models: Patriot Sport, Latitude and Limited. All are available with front-wheel drive, the Jeep Freedom Drive I full-time active 4×4 system or the Freedom Drive II off-road full-time active 4×4 system with low-range capability. The 2015 Jeep Patriot Sport model is powered by the 2.0-liter I-4 World Gas Engine (producing 158 horsepower (117 kW) and 141 lb.-ft. (191 N•m) of torque) mated to a five-speed manual transmission. Standard features include: front-seat-mounted side air bags, all-row side curtain air bags, electronic stability control, electronic roll mitigation, Hill-start Assist, advanced multistage front and passenger air bags, anti-lock front disc and rear drum brakes, audio jack, fog lamps, illuminated cup holders, floor mats, outside temperature display, fold-flat 60/40 folding rear seat, rear seat heat ducts, rear window defrost and wiper, front sliding visors with mirror, tilt steering column, cruise control, deep tint glass and roof side rails. off-road package that delivers a 19:1 overall crawl ratio. The 2015 Jeep Patriot Latitude model offers the standard features of the Sport model, as well as the following standard features: air conditioning, power windows, power door locks, power heated exterior mirrors, illuminated keyless entry, 17-inch aluminum wheels, front heated cloth seats, rear 60/40 seat recline, driver seat height adjuster, 115-volt power inverter, body color exterior door handles and liftgate brow and leather-wrapped steering wheel with audio and speed controls. Optional transmissions include the six-speed Powertech automatic transmission or the CVT2L transmission with the Freedom Drive II off-road package that delivers a 19:1 overall crawl ratio. In addition to the standard features offered on the Latitude model, the 2015 Jeep Patriot Limited includes: 2.4-liter I-4 World Gas Engine producing 172 horsepower (129 kW) and 165 lb.-ft. (224 N•m) of torque mated to the new 6F24 Powertech six-speed automatic transmission, leather seats, four-wheel anti-lock disc brakes, driver’s seat manual lumbar adjust, leather-wrapped parking brake handle, six-way power driver’s seat, Electronic Vehicle Information Center (EVIC), AM/FM/six-disc CD/DVD/MP3/HDD radio, SiriusXM Radio, automatic temperature control, bright exhaust tip and bright accents on the front and rear fascias. The 2015 Jeep Patriot is available in the following exterior colors: Eco Green Clear Coat, Billet Silver Metallic Clear Coat, Black Clear Coat, Bright White Clear Coat, Deep Cherry Red Crystal Pearl Coat, Granite Crystal Metallic Clear Coat, Maximum Steel Metallic Clear Coat and True Blue Pearl Coat. Built in the United States at the Belvidere Assembly Plant in Belvidere, Illinois, 2015 Jeep Patriot models will arrive in dealer showrooms in the third quarter, 2014.